This past December 28th would have been our beloved Ngoc Lan's 58th birthday. It's hard to believe when I think about it. I wonder how she would look like today if she had not been taken from us. Last week I went with a friend to go visit her grave site. It was an emotional experience for me. This was the first time I had been there since her funeral almost 14 years ago. When I arrived at the cemetery, I went to the front office to ask where exactly her grave site was located. It has been a long time. I still had a pretty idea where it was, but there are so many that I really didn't have the time to be walking around searching. When asked by the reception desk, I gave them the name Maria Thanh Lan Le since that was her real name. Nobody had any idea who that was. 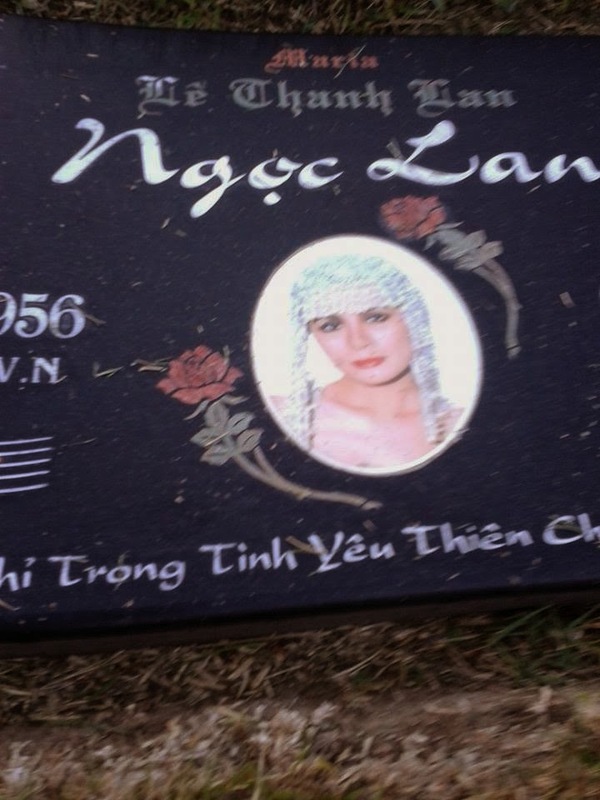 Then I looked at this Vietnamese man who was also a worker there and said, "Do you know where singer Ngoc Lan is buried?" Right away, he pulled out what looked like a brochure from his desk drawer that had her photograph printed on it along with a map to where her grave site is located. I then asked if people still visited her grave site often. His response was, "Yes, her grave site is probably the most asked about since I've worked here." In a strange way, that made me happy. Even with the map, it wasn't easy to find. I walked over to the region where she is buried and I still couldn't find it. Just when I was about to give up, I looked up and said aloud, "Chi Lan, where are you?" And then as I turned, I saw her picture at her grave site. I was amazed. It was as if she heard me. There were no flowers at her grave site that day. I was rather surprised. I sat down and started to cry. I said, "Chi Lan, it's me, Phu. I always wanted to tell you thank you for all that you had taught me. I love you very much. Happy birthday!" Just then I couldn't take it anymore and so I left. I hate talking about her death. A part of me still wants to believe she is still here with us. So am I, my friend!